This article has been generously shared with the Coach's Clipboard by Coach Joao Costa (JC) who played professional basketball in Europe. He subsequently moved to the United States to expand his knowledge of the game and train to be a basketball coach, and now lives in Seattle, Washington. Coach JC started his coaching career in the United States and coached in the Seattle area before going on the road to develop his coaching techniques. Coach JC has participated in practices and observed the coaching techniques of some of the best NCAA Coaches in the country: Coach Mike Krzyzewski, Coach Roy Williams, Coach Eddie Sutton, Coach Hubie Brown, Coach Tom Newell, Coach Bob Bender... just to name a few. Coach JC has been coaching in USA for several years, ABA, WBA, ProAm as well as internationally, and has conducted coaches clinics and basketball camps around the World. He has been a featured guest speaker on both the national and international level. Visit Coach JC's web-site. Facing aggressive full court man-to-man defensive pressure can be a challenge for any team. For teams to be consistently successful advancing the ball against man-to-man pressure, perimeter players (1, 2 and 3) must develop the ability to advance the ball to the frontcourt with the dribble against a one-on-one defender. Teams that rely only on their point guard to advance the ball will struggle against pressure. During practice it is critical to create one-on-one situations for ballhandlers in order to prepare them for the game time pressure. Remember that players 1, 2 and 3 are interchangeable and any of them can get the inbound pass and advance the ball up the court. This is what attacking any full court press is all about. Here are some plays with options to attack the pressure. Note from Coach Gels... this attack should work well not only against man-to-man presses, but match-up press defenses as well, since after the first pass or dribble, the match-up (and most press defenses for that matter), assume man-to-man principles with trapping, deny and helpside. Player 3 begins the play by breaking to the ballside wing asking for the ball. Player 2 screens 1's defender then cuts towards 4 (inbounder) to get the ball. Player 1 cuts to baseline looking to get the pass from 4. Player 4 can inbound the ball to 3, 2 or 1 to start the fast break. Note: If player 3 gets the pass from 4 he will take the ball down the court while player 2 takes the right lane and 1 the left lane. Player 4 will be the trailer. Player 1 dribbles down the court. Players 2 and 3 fill the lanes with 4 as trailer. Player 5 stays at elbow then moves opposite low post. Players 3 and 5 screen for 2. Player 1 passes to 2 at left wing. Player 4, the trailer, cuts to the basket. Player 2 can shoot or feed 4 inside the box for layup. Player 3 breaks to the ballside wing asking for the ball. At the same time player 1 cuts to opposite short corner to get screened by 2. When player 2 screens 1's defender he then seals the defender at baseline and reaches for the ball towards the inbounder 5. Player 5 can inbound the ball to 1 or 2. Player 1 takes the ball down the court. Players 2 and 3 fill the lanes. Player 4 goes to the left side of the block. Player 5, the trailer, stays behind player 1. Player 5 screens for 2 and rolls to the basket. Player 1 passes to 2 for a shot at the top of the key. If player 2 cannot shoot then he passes to 5 inside the lane. Remember, players 1, 2 and 3 can take the ball down the court and initiate the half court offense. Player 3 screens for 1. Player 2 screens for 3 and rolls to the basket toward 4 the inbounder. Player 4 looks to hit 1, 2 or 3. Player 2 dribbles down the court. Players 1 and 3 fill the lanes. Player 5 goes to the top of the key. Player 4 is the trailer. Player 4 runs down the court to the opposite low post. Player 5 down screens for 4. Player 4 comes up to the elbow to get the pass from 2. Player 3 screens for 2 then gets open on the weakside corner. Player 2 moves to the ballside corner. Player 5 cuts toward the inbounder 1 to get the ball. Player 5 catches the ball and quickly hands off to 1. Player 4 takes position at the elbow. Player 1 advances the ball. Player 4 stays at elbow. Player 5 is the trailer. Player 1 passes to 2. Player 2 hands off to player 1. Player 4 for screens for 3. Player 1 drives to the basket for layup. At the same time player 4 screens for 3. Note: If 4's defender tries to stop 1 from going to the basket, player 1 looks for 3 at free throw line for a shot. 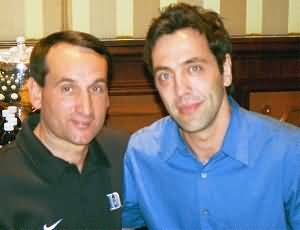 with Mike Krzyzewski "Coach K", Duke University Head Men's Basketball Coach; 12X Coach of the Year, Naismith Memorial Basketball Hall of Fame. with Fred Hoiberg, Head Coach Chicago Bulls. with Billy Donovan, former University of Florida Head Coach; head coach Oklahoma City Thunder.